Let your guest book directly on your homepage. CultBooking is the online booking software for your homepage. It provides direct interfaces to a variety of PMS and CRS systems. CultBooking is connected to our Channel Manager CultSwitch. So all offers, rates and bookings with your hotel software can automatically be matched, as long as it has an interface to CultSwitch. With CultBooking, your website is a distribution channel! Try out how it's working (Template 3 - all options on one page). More templates for different needs you will find under "Standard version CultBooking". This version is ready for immediate use. The design is standardized. The individual adjustment of colors and fonts can be commissioned. The application is installed on Cultuzz servers. Dynamic data (availability and prices) (CSI) are maintained in your hotel software (PMS), in your Destination Management System (DMS) or in Cultuzz's service interface. Each hotel product can be sold with CultBooking. You decide which product might be interesting for your guests, and your Cultuzz team will assist you with the preparation of an offer. In addition, you can create an offer that highlight its uniqueness and attractiveness and encourages your visitor to book other products on your website. The differentiation of age groups among children, as well as in the number of room nights with different prices (maintained directly by your PMS or manually) are just some of the benefits of CultBooking. Freely configurable elements (rooms, for example), with price hikes or discounts for variations in occupancy, arrival and departure days, as well as cancellation and booking policies will be transferred directly from the hotel software. CultBooking offers five different design templates that meet all the needs of your website visitors: the business traveler may prefer to search for bookable products at a fixed time, while a leisure guest may choose a calendar with an overview of bookable appointments and current prices. A booking mask with 5 pages, which guides the visitor through the checkout process step by step. At the beginning he only has to enter arrival and departure date. Quick availability request. After this the checkout is done in 3 steps. Displays all travel products on the first page. After selection the booking is finished in only 2 steps. 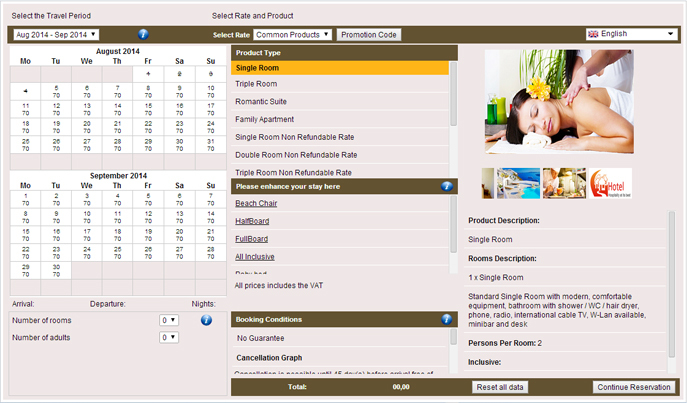 Integrates the entire booking on one page. Offers all options by displaying the results simultaneously. The booking is made in the next step. We will discuss which version is best for you. In the standard version, the mask can be immediately integrated via iFrame into your website.